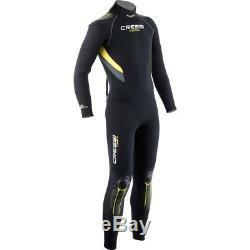 Cressi Castoro Men's 5mm Jumpsuit. The Cressi Castoro Men's 5mm Jumpsuit is a stylish, warm and versatile. Suit is made from durable yet soft double lined (nylon II) neoprene, Stands up well to compression at depth for maximum heat retention. The suits are anatomically designed with pre-shaped legs for improve flexibility and easier kicking. The suit has a rear zipper entry with durable YKK-zipper and aqua-stop under zipper lining. Zipper is also equipped with a pull tab leash for easy donning and doffing. Suit has 2mm wrist and ankle cuffs with Metallite lining for a positive seal with skin or boots. Durable Power Tex reinforced knees, shins and shoulders and glued and sewn seams ensure added strength for seasons of reliable use. The rear zipper closure has a finger loop at base of the zipper, neck hook and loop fastener and zipper stop. The Castoro 5mm Jumpsuit comes in multiple sizes. Stylish, Warm and Versatile Suit. Durable and Soft 5mm, Double-Lined (Nylon 2) Neoprene. Stands-Up-Well to Compression-at-Depth for Maximum Heat Retention. Anatomically Designed with Pre-Shaped Legs for Improve-Flexibility and Easier Kicking. Zipper Tab Leash for Easy Donning and Doffing. Finger Loop at Base of Zipper. Metallite Lining: Positive Seal with Skin Gloves or Boots. Power Tex Reinforced Knees, Shins and Shoulders. Glued and Sewn Seams Ensure Added Strength. Neck Hook and Loop Fastener and Zipper Stop. Rear YKK-Zipper with Pull Leash. Feedback is a very powerful tool. Hours: Mon-Thu: 9:30-5:30, Friday: 9:30-12:30. Please do not request to have an item relisted if you do not see it any more. If we are able to relist, we will do so even without your request. We will not mark any package as a gift. Please wait 8 days from date we received the package for us to process your return. The item "Cressi Castoro Men's 5mm Jumpsuit" is in sale since Saturday, August 25, 2018. This item is in the category "Sporting Goods\Water Sports\Wetsuits & Drysuits\Wetsuits\Men". The seller is "leisurepro" and is located in Elizabeth, New Jersey.